With forecasters predicting a 90 percent chance of good weather, the shuttle Discovery's seven-man crew flew to the Kennedy Space Center today for the start of the countdown to blastoff Wednesday on a delayed space station assembly mission. The countdown began at 7 p.m., setting the stage for launch of the 125th shuttle mission at 9:20 p.m. Wednesday. 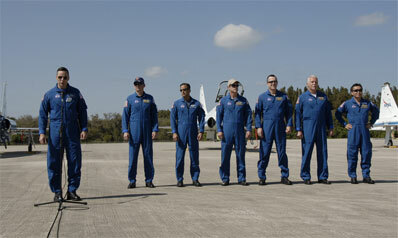 Commander Lee Archambault, pilot Dominic "Tony" Antonelli, Japanese astronaut Koichi Wakata, station veteran John Phillips and spacewalkers Stev Swanson, Richard Arnold and Joseph Acaba landed at the shuttle runway in two waves, at 2:37 p.m. and around 3 p.m., after flights from Houston aboard T-38 jet trainers. "I wanted to welcome you here to the Kennedy Space Center and tell you how thankful we are for this launch coming up on Wednesday," Archambault told reporters at the landing strip. "We're very excited to be bringing the S6 truss up to the space station to give its final complement of power. We're ready to get it going Wednesday afternoon." There are no technical problems of any significance at launch pad 39A and forecasters are predicting good weather all week: 90 percent "go" on Wednesday, dropping slightly to 80 percent Thursday and Friday because of a slight chance of showers in the area. Conditions at emergency runways in California, Spain and France also are expected to be acceptable for launch. The goal of Discovery's mission is to deliver and attach a $300 million set of solar arrays on the right side of the station's main power truss. The starboard 6, or S6, truss segment is the fourth and final set of power panels to be attached to the lab complex and the final major U.S.-built station component scheduled for launch aboard a shuttle. Discovery originally was scheduled for launch Feb. 12, but the flight was repeatedly delayed by concern about suspect hydrogen flow control valves used to pressurize the hydrogen section of the shuttle's external tank. Archambault took a moment today to thank the engineers and technicians who carried out around-the-clock work "over this last month or so to take care of the flow control valve problem." "We're very happy it's been resolved successfully," he said. "We're ready to get going."